Did you ever hear of Voodoo.com? Quite likely not which is more the pity. Voodoo was founded 20 years ago by Fabrice Sawegnon. The advertising agency is headquartered in Abidjan, Ivory Coast. Sawegnon likes to control his image, that’s why he prefers posting on Instagram, Facebook and Twitter, and declines to be interviewed. Voodoo made a name for itself in 2015 when it became part of the reelection campaign of Alassane Ouattara, the current president of the Ivory Coast. Voodoo’s innovative approach was so successful, that it not only put the ad agency firmly on the map, but also resulted in its reputation as a kingmaker. 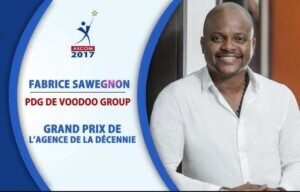 But voodoo also weaved its magic for companies such as French telecom Orange, beer and beverages company Castel, and Air Côte d’Ivoire. Voodoo positions itself as an African ad company; so why to go shopping in Europe or the US when you can get the best of the best locally? However, using Voodoo is not exactly cheap. Its turnover is estimated at 14M Euro. But CEO Sawegnon knows how pot fundraise and had great political connections. The latter will serve him well when he runs for mayor in Le Plateau, the business district of Abidjan. Voodoo also contributed to the reelection of Mali’s president Ibrahim Boubacar Keïta for an additional term of two years. His campaign positioned him as “Keïta the Savior”. Slogans included “building peace”, and “together for progress”. One thing is for sure, Voodoo is a force to be reckoned with.